The evenings begin at 6:00 p.m. in the park’s Recreation Hall with a brief interpretive program led by a Camp Helen Park Ranger or other expert. The program will be followed by an old-fashioned campfire cookout of hot dogs and s’mores provided by the Friends of Camp Helen. Each evening will conclude with a family-oriented movie in the Recreation Hall, where seating will be provided. A parent or guardian must accompany all children. 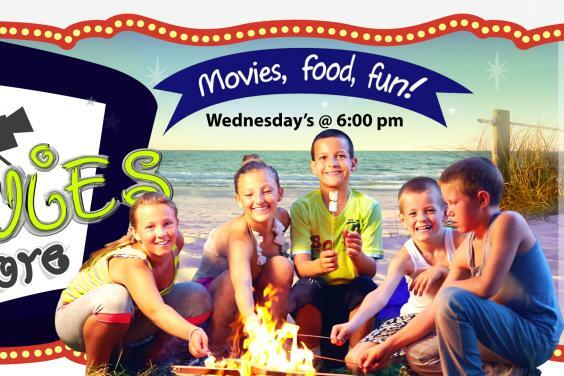 These special movie nights are sponsored by Florida’s Department of Environmental Protection, Panama City Beach Convention and Visitors Bureau, and the Friends of Camp Helen State Park. Admission into the park for this event is free, although donations are accepted. Donations will go directly to the Friends of Camp Helen State Park to benefit the park's resource management projects and interpretive programs. On Wednesday, June 5: Open Season Scared Silly (Rated PG) - Boog, Elliot, and the rest of their pals team up to track down an elusive werewolf and prevent their forest from being intruded upon by Hunter Shaw. Seacrest Wolf Preserve will be presenting the interpretive program about building respect for wolves in the natural world. Then, on Wednesday, June 19: Dolphin Tale, (Rated PG) - A young dolphin, loses her tail in a crab trap and Sawyer, a young boy, befriends her at a Marine Aquarium. Sawyer rallies friends and family to save Winter by having a doctor build a unique prosthetic attachment to restore Winter’s ability to swim. Gulf World Marine Institute will be presenting the interpretive program about how they care for animals rescued from the wild. On Wednesday, July 10: Moana (Rated PG) - A teenager, leaves her safe island on a journey to save her people. She convinces the mighty demi god Maui to join her mission. Together, they voyage across the ocean on an action-packed adventure. The marine touch tank interpretive program will be about sea life in the area by the Choctawhatchee Basin Alliance. On Wednesday, July 24: Over The Hedge (Rated PG) - A crafty raccoon tricks his fellow forest creatures into helping him replace the food he stole from a mean bear. 30A Sealife Discovery Center will be presenting the interpretive program about connecting children to the ocean through hands-on experiences. More information is available at facebook.com/FriendsOfCampHelenStatePark, by calling (850) 233-5059 or by emailing CampHelenFriends@gmail.com. Camp Helen State Park is located at 23937 Panama City Beach Parkway (Highway 98), Panama City Beach, just west of the Lake Powell Bridge.